Do you want to dive deeper into blatant human rights issues? 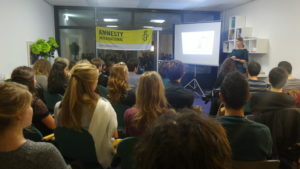 Do you want to learn more in-depth about human rights topics or feel passionate about a certain topic that relates to Amnesty and want to spread awareness to your fellow Wageningen students? Then this is the perfect platform. Next to the Movie Night each period, we organise in-depth events surrounding refugees, women’s rights, gay pride, ethnic profiling, torture, violence and many more. Take initiative, try new things, be enthusiastic and passionate about your topic.